IBAS Coordinator Laurie Kazan-Allen and some of her heroes. April 2014. 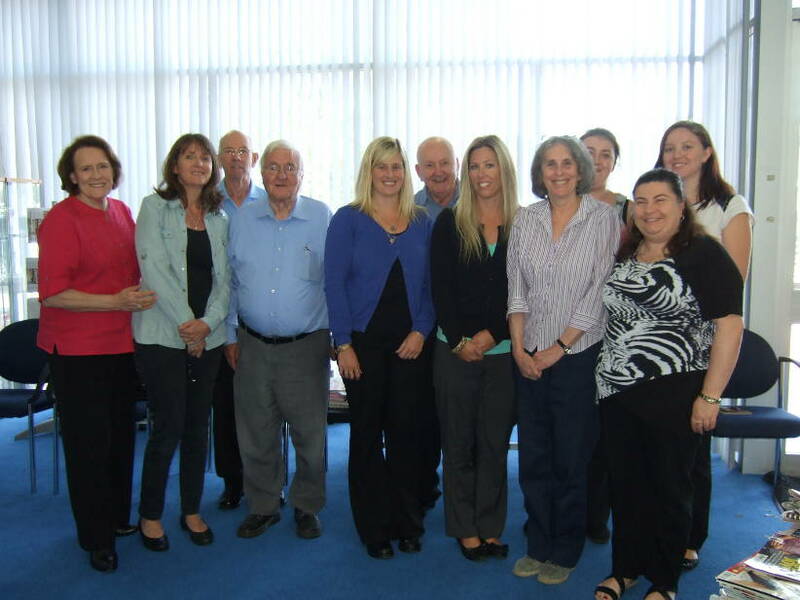 Having had the privilege of spending some time with them at their Perth offices over recent weeks, I can report that their commitment to the injured is unflagging, their level of political mobilization remains high and their tenacious determination to protect future generations from the scourge of asbestos diseases is inspirational. Day after day these individuals wage a full-on war against asbestos injustice and yet they do so within an environment which is welcoming and supportive. The piles of case notes, the banks of filing cabinets and the overloaded bookcases are testament to the tens of thousands of members who have been assisted by ADSA staff yet no one is treated like a number. Each person who walks through their doors is greeted as a friend and receives the care and attention that one would wish for their nearest and dearest. How they do it, I don't know but they do. Bearing in mind that each of the 305 members who died in 2013 from asbestos-related diseases was a friend, the ADSA's ability to maintain a relaxed atmosphere and a productive schedule is truly amazing. While the figures above are informative, they represent only a tiny part of the work done by the ADSA. Much of the impact of the Society's efforts is unseen. The ADSA, in consultation with its members, politicians and legal advisors, has been instrumental in changing dozens of laws to improve victims' access to justice and support. It has advocated relentlessly on behalf of its members and developed an unparalleled expertise in asbestos issues. The Society pioneered efforts to pierce the corporate veil which had, in the bad old days, bullet-proofed Australian corporations from asbestos claims. It stood toe to toe with obstructive civil servants, devious politicians and profit-driven businessmen such as Lang Hancock, the Australian entrepreneur who developed the infamous Wittenoom Crocidolite Mine. As late as 1990, Hancock denied that exposure to asbestos could be harmful: There is he wrote no asbestos in the town [Wittenoom] that is of any harm to anyone.3 And yet, thousands of Wittenoom miners, millers, transient workers, visitors and residents have died from asbestos-related diseases. Thanks to the Society and its legal advisors claims arising out of [Wittenoom] exposure post-1966 are all resolved. None took longer than about four months. The Society has an abiding commitment to medical research and to this end has developed close relationships with leading Australian figures working in this field. 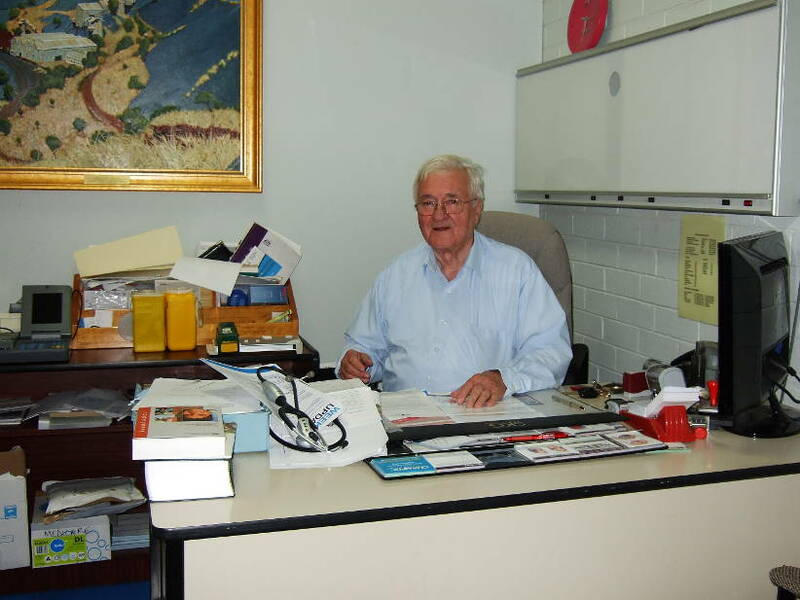 The archive of blood samples collected by Perth scientists, an invaluable tool for research into asbestos-related diseases, has been supported by the ADSA whose members freely and gratefully supplied blood and DNA samples over more than twenty years. If you think that all of this sounds too good to be true, I would agree except that I have seen it first hand; this much and so much more can be said about this incredible group of people. Laurie Kazan-Allen, the Coordinator of the International Ban Asbestos Secretariat and long-time friend of the ADSA, discussed current developments in the worldwide campaign to ban asbestos, highlighting the attempts by Russian asbestos lobbyists to co-opt international agencies and derail attempts to impose controls on the global asbestos market. Professor Anna Nowak addressed the subject of new treatments for the asbestos cancer, mesothelioma. Professor Nowak, a medical oncologist and a member of the National Research Centre for Asbestos Related Diseases, is well-known and well respected by the Society for her clinical work with asbestos patients at the Sir Charles Gairdner Hospital in Perth. Her research work is supported by ADSA fund-raising events including an annual walk and golfing competition. 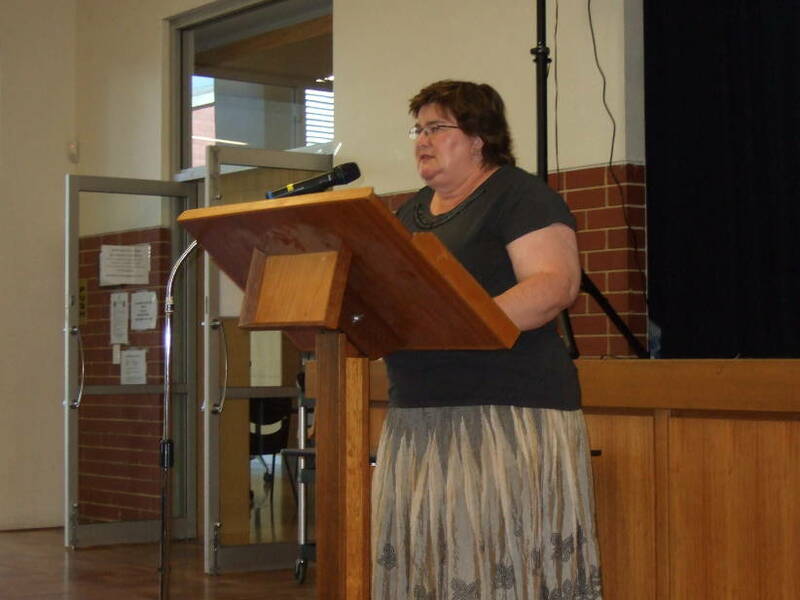 Kate Doust, a Member of the Legislative Council of Western Australia (WA), discussed the progress of her private member's bill, The Asbestos Diseases Compensation Bill 2013, which aims to equalize the legal rights of asbestos victims in WA with those of claimants in other states. The Hon Kate Doust MLA. 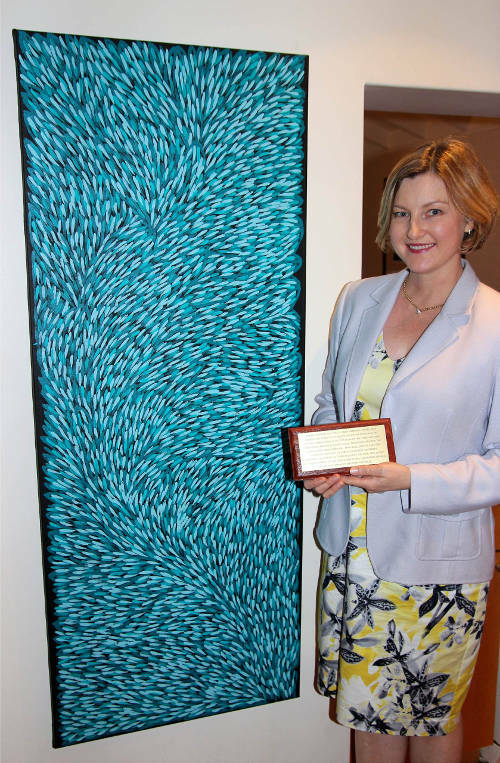 Professor Anna Nowak and the painting Bush Medicine Leaves by artist Gloria Petyarre presented by the ADSA on March 16, 2014. Dr. Greg Deleuil in his ADSA office. I feel honoured to have witnessed the activities of one of the world's most outstanding grassroots citizens' advocacy groups in Perth earlier this month. Although the walk to raise public awareness and research funds is still five months away, I left a small contribution. It was, after all, the least I could do. I hope you will do the same. 2 Rabe T. Deadly Legacy. Stirling Times. February 4, 2014. 3 Marshall D. The House of Hancock: The Rise and Rise of Gina Rinehart. William Heinemann Australia, 2012. 4 University of Western Australia Press Release: Award recognition for excellence in care for asbestos victims. March 20, 2014. 5 Candler R. Asbestos Crisis at Lords. March 25-April 1, 2014 edition of the Western Suburbs Weekly. 6 Gorman L. Lords tenants pray for help. Post. March 29, 2014. [Pages 3 & 109].